Fares are good from origin to end of line. Bus fare boxes accept U.S. coins and dollar bills and Mountain Metropolitan bus passes. No tokens or pennies. Please have exact fare or pre-purchased ticket. Neither the bus driver nor the farebox can provide change. *Special Riders, please be prepared to show proper ID or proof of eligibility upon request. The Special 20-Ride and 31-Day tickets provide significant savings for individuals who meet specified age criteria or disability requirements. You must have the required ID to purchase or ride with this pass. 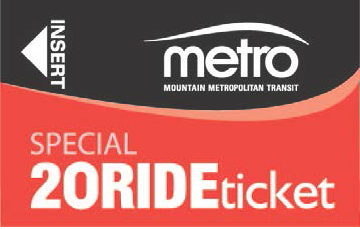 Please take care of your pass since Mountain Metropolitan Transit is under no obligation to honor or replace lost, stolen or visibly damaged passes. Medicare/Disabled Mountain Metro will only accept the following documented proof of permanent disability: 1.) a valid Medicare Card; or 2.) 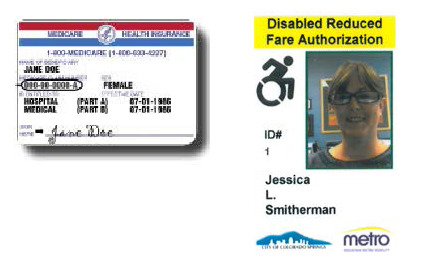 a Disabled Reduced Fare Authorization "Yellow Card" issued by the Independence Center. Mountain Metro offers the reduced fare authorization card through the Independence Center to better serve our customers. The Independence Center, at 729 South Tejon, is more centrally located than Metro’s administrative offices and is easily accessible in the downtown area from bus Routes 10 and 11. For information on how to obtain a Disabled Reduced Fare Authorization "Yellow Card," please call the Independence Center at 471-8181 or go to 729 South Tejon. Please be prepared to show proper ID or proof of eligibility upon request. TICKETS WILL BE REVOKED UPON MISUSE. Transit Administration Office- 1015 Transit Dr.
Citadel Mall Transfer Center - 750 W. Citadel Dr.
El Paso County Citizens Service Center - 1675 W. Garden of the Gods Rd. Ticket must be accounted for in farebox. 31-Day ticket is valid for one passenger only. Special ticket holders, please be prepared to show proper ID or proof of eligibility upon request. Ticket is subject to revocation upon misuse. Possession and care of ticket is the responsibility of the ticket holder. Mountain Metropolitan Transit is not responsible for replacement of damaged, lost, or stolen tickets. ALL TICKET SALES ARE FINAL. NO REFUNDS OR EXCHANGES OF MOUNTAIN METROPOLITAN TRANSIT TICKETS ARE PERMITTED. Purchase of ticket does not guarantee bus service or continuation of routes. Bus schedules, routes, equipment, and fares are subject to change without notice. Mountain Metropolitan Transit is not responsible for replacement of damaged bus tickets. If your ticket does not work in the fare box because it is damaged, you will be required to pay the fare or purchase another ticket.